Fall is one of the two best times for adding new plants to gardens and a good time for looking at the curb appeal of your entry garden. Before adding colorful fall mums, pumpkins, and door wreaths, refresh the whole front entry porch and entry garden space to welcome visitors for upcoming fall and winter holidays. And to prepare your front entry for the harsh weather to come. The first step is to clean the front door. 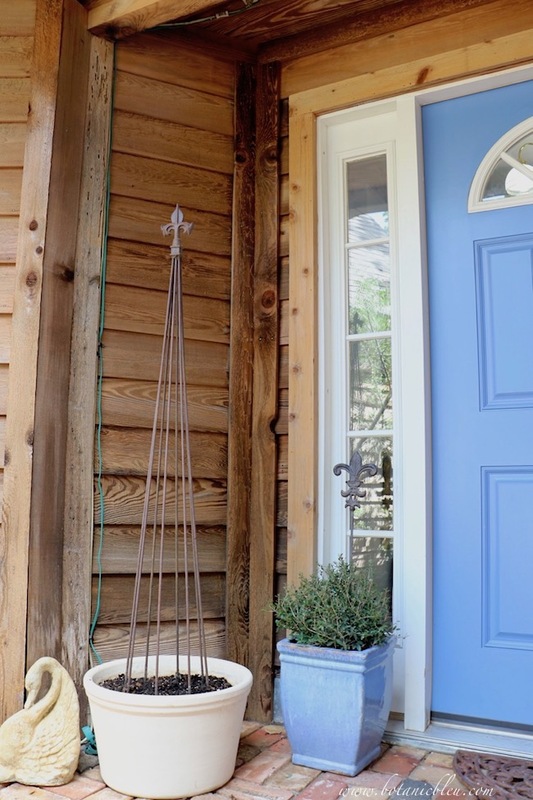 The fastest, least expensive one thing to give a fresh welcoming look at the front porch is to clean the area. Wash the windows in your front door and surrounding side lights. Clean around the door knob and lock to remove built-up grim from dirty fingers opening and closing the door. Remember to clean the thickness of the door, too, not just the outside and inside of the door handle area. Give the doorbell a once-over cleaning to remove dirt and to sanitize it. The doorbell and doorknob are the two spots that almost all people touch coming or going. Periodically sanitize both to help keep them clean and everyone healthy. If you do not have time, energy, or money to do anything else, there is nothing like a good cleaning to welcome everyone . . .
family, friends, UPS drivers, . . .
And, it will make your eyes and heart happy to see everything *s*p*a*r*k*l*y* clean. Have you ever used a power washer to clean decks, outdoor furniture, or house siding? The results are like MAGIC! I love using a power washer because there are instant results. No waiting ten minutes for it to work. One moment the house siding is gray, dingy, dirty and the next moment, right before your very eyes, the siding is all clean and almost new looking. By the way, not only will the siding get a good cleaning, you will get a good soaking from water rickashaying off the wall. Wear old clothes. Goggles are a good idea, too. And, with cedar siding, you can smell the wood again. No joke. Two days after power washing the siding, a landscape worker was planting some new shrubs. He looked up and asked if the siding were cedar. "You can smell it," he said, with a big grin on his face. 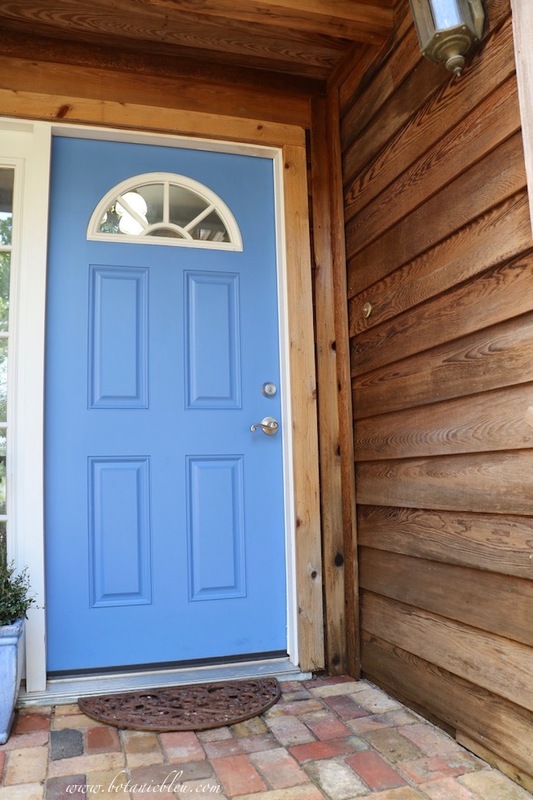 Once everything is clean, clean, clean, touch up the paint on your front door and surrounding areas. Painted surfaces get little dings here and there from being used. It is part of everyday living. 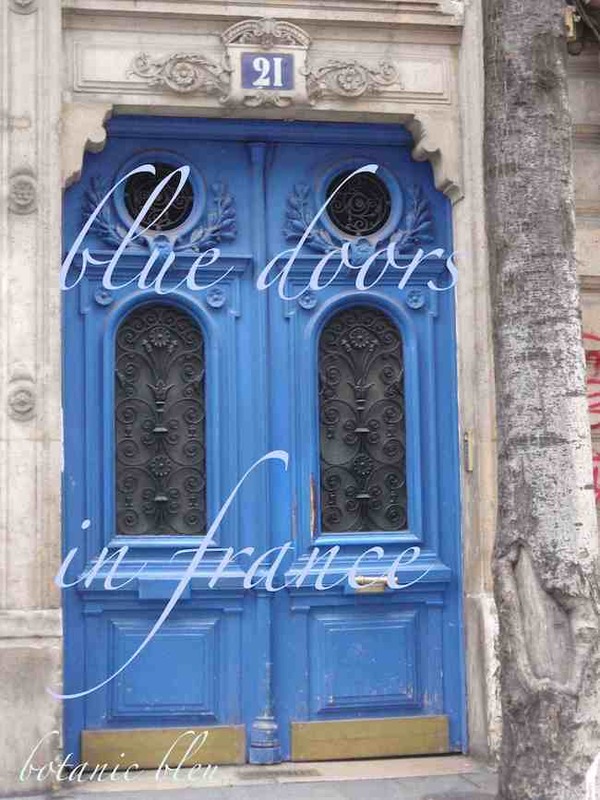 France is where I fell in love with blue doors and got the inspiration to paint my front door its bright blue color. You may have left-over paint from when your door was painted. 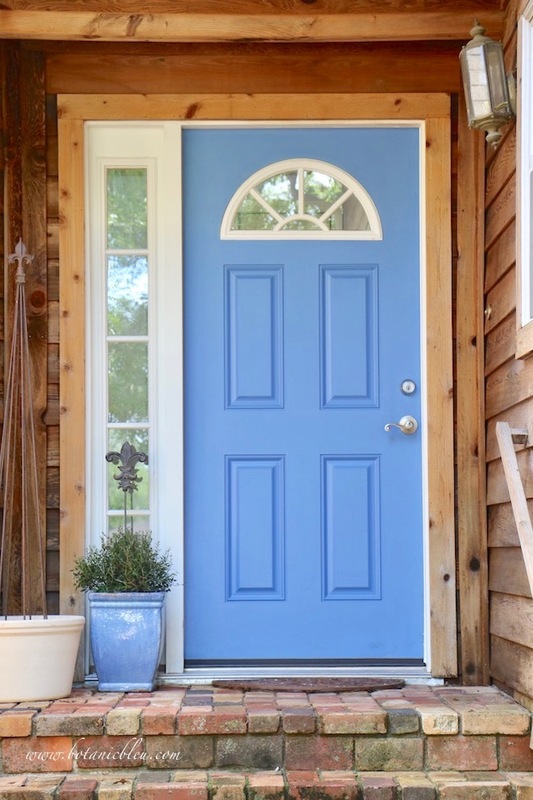 Grab that bucket of paint and make your front door look new again. If you did not label the paint can when you originally painted the door, now is a good time to use a permanent marker to label the top of the can FRONT DOOR and write the year when the door was painted that color. Over the hot summer, some plants may have suffered from heat stress or even died. 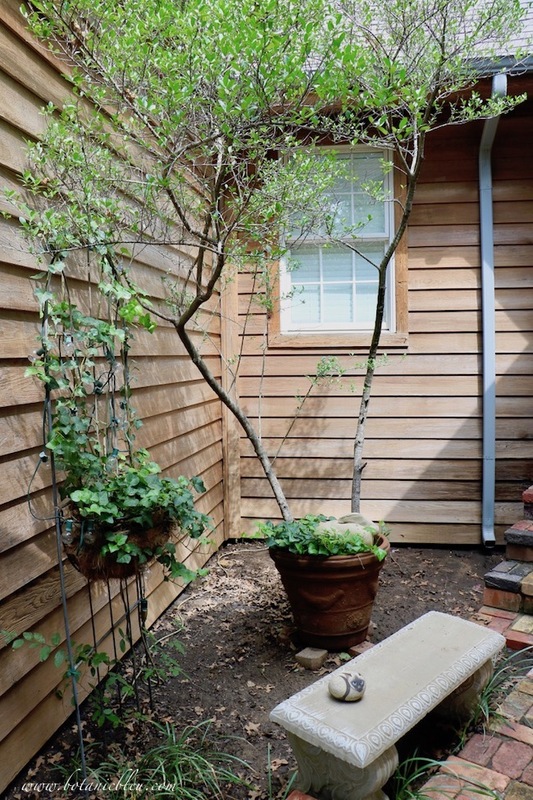 Remove any scraggly looking plants like the lirope in my entry garden. Trim tree limbs and plants on trellises or in containers. Trim tree roots and rake leaves. Take a look at that super-duper clean siding! Before cleaning, the siding color more closely matched the gray downspout. 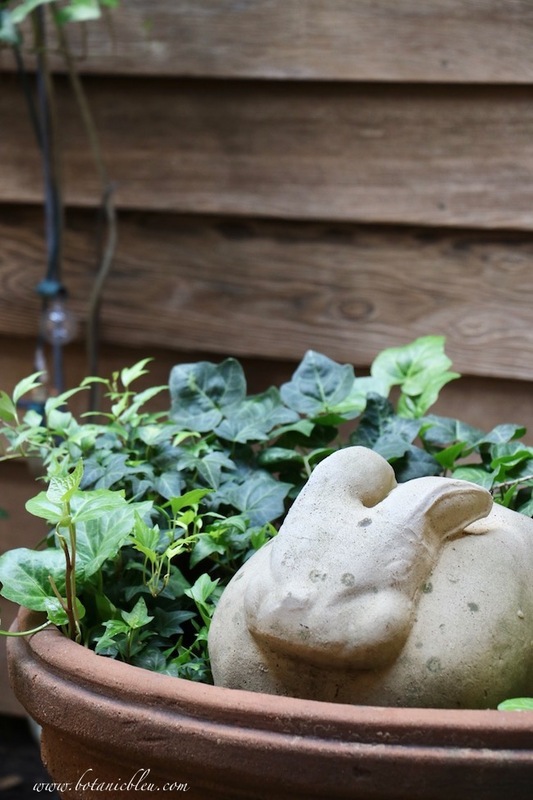 With cooler temperatures and more rainfall, Fall is a good time to replace old plants and to add new plants. Over the dormant winter months the plants will expend their nutrients to grow their roots instead of foliage and flowers which helps them survive their first hot summer. 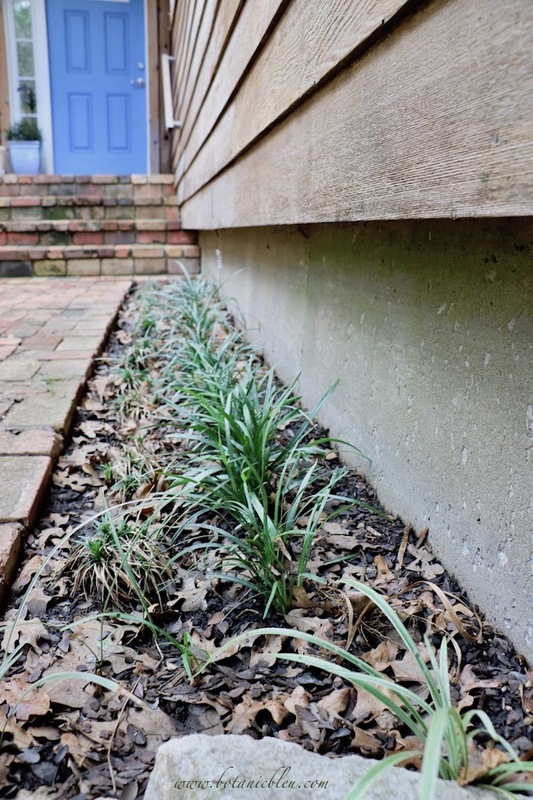 The narrow bed between the old Chicago brick sidewalk and house has low mondo grass and green lirope clumps. By taking them out and adding new boxwood shrubs, the new boxwoods will hide the house foundation and add French Country style to the front entry garden. Fall is one of the times of the year to give plants, shrubs, and trees fertilizer. While sprucing up a garden, remember to add fertilizer to help plants stay strong and healthy during the coming bad winter weather. After giving everything a good cleaning, touching up painted surfaces, replacing plants with new ones, and adding fertilizer, the front entry garden and front porch are ready for seasonal Fall mums, pumpkins, and wreaths. Everything adds eye-catching curb appeal just in time for the busy Fall and Winter gatherings. 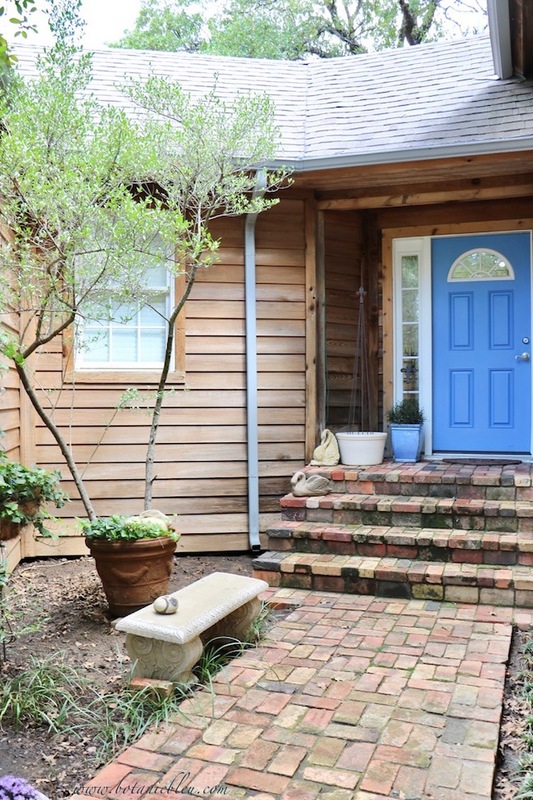 🍁 My new front entry garden landscaping will be in, and the front porch will be all decorated for a Celebrating Fall Outdoors: Porches, Patios, and Gardens Tour on October 2, 2018 with over 20 other blogging friends. For now, you may enjoy the following Fall inspiration. Filled with memories of my late mother. One of my most popular posts. Pinning here daily from sources all around the Internet. More Fall inspiration is coming your way. to see the biggest mums I have ever seen! Yes, there's a lot of maintenance to do in fall, and that's a great checklist! It all looks and feels so good once it's complete, doesn't it? I've already cleaned my porch doors, floor, and surrounding first floor windowsills (summer spider webs at landscape lights) just to change door wreaths, but will need to do it all one more time when the garden is cleaned up in late fall (for Christmas decor, lol). I love your brick steps and walk. I need to work on the front walk when budget allows and I will have to check into that lovely brick and if it would work in my area. Lovely home right from the front door! Everything looks lovely Judith. I need to power wash my porch again before I bust out all the fall decor. We leave our porch lights on at night and oh my the bugs that are everywhere. Doesn't help our house is white. Judith, I agree with you 100% about these seasonal tasks. I also like to put new mulch in my flower beds in the fall. New mulch makes the area seem so much fresher. Fall certainly seems to be the time of the year for major clean-up and freshening up too. Growing up in the West,Fall was always the time of the year to prepare for the upcoming Winter. Tends to remind me of The Ant and Grasshopper fable and the merits of preparation! 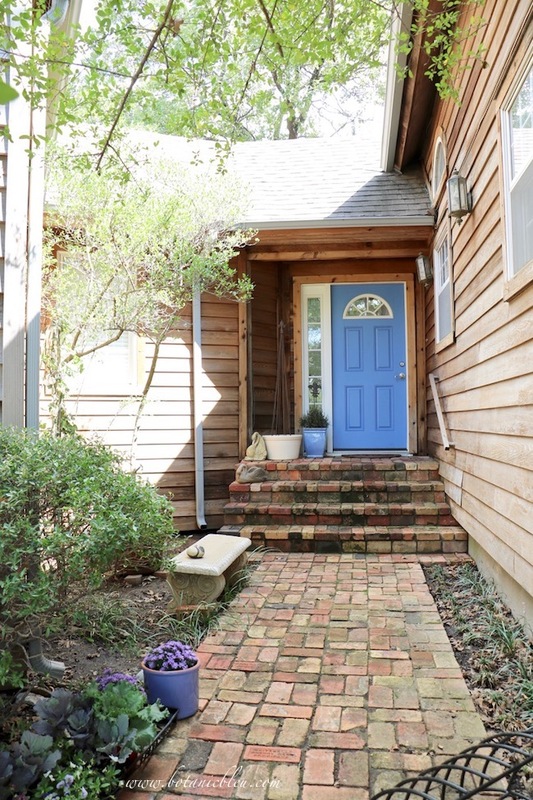 Love your blue door by the way. Thanks, Candy, for visiting and leaving such a nice comment. I'm busy working on adding more color and plants to the porch and entry garden for Fall and Winter. I like how it is all coming together. Hello sweet Judith I am catching up with you this morning. 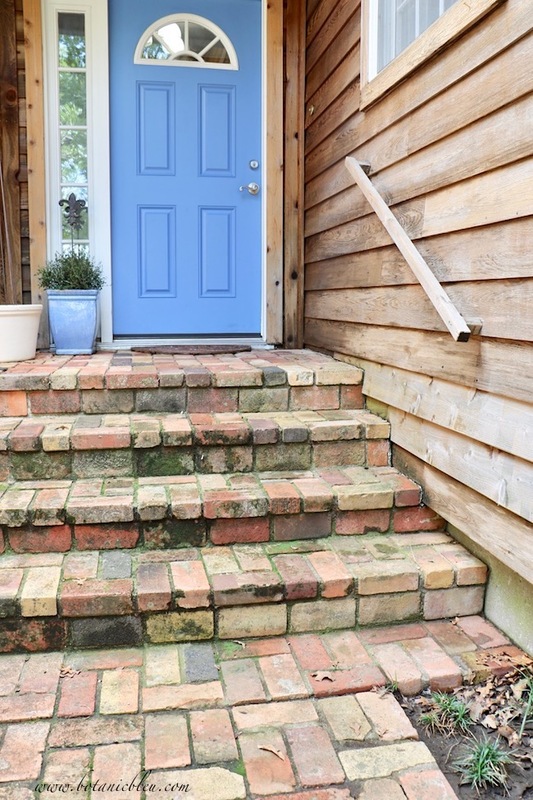 I so agree that a welcoming entry is such a lovely gift to friends and neighbors. I hope you are enjoying a lovely October.